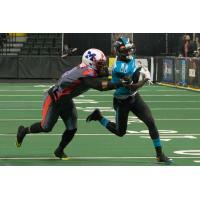 St. Charles, MO - The St. Louis Attack defeated the Marion Blue Racers, 48-23, in X-League football action Friday night, April 24 at the Family Arena. 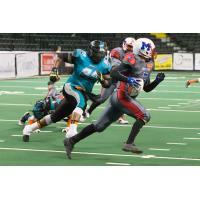 The Blue Racers handed the Attack a 33-29 loss last Saturday in Marion, but it was a different story in Friday's rematch. New Head Coach Pat Pimmel had his team firing on all cylinders as they gained the lead in the second quarter and never relinquished it. 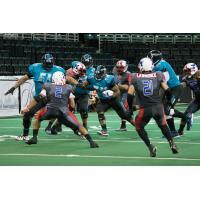 The win improved the Attack's records to 3-2, while the Blue Racers are now 2-2. Marion got off to an early start offensively and led 9-4 at the end of the opening quarter, but two Attack touchdowns in the second quarter helped turn the table on the visitors. Quarterback Mike McMullen threw a 24 yard pass to Aric Evans, who made a spectacular catch at the wall and McMullen pushed his way into the end zone from the one yard line later in the quarter, which ended with St. Louis enjoying a 19-9 lead. A reception by Deandre Jackson resulted in the only touchdown of the third quarter, which saw St. Louis' lead increase to 26-9. 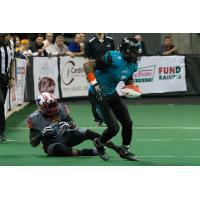 Quarterback Dan McMullen made a one-yard run in the fourth quarter and Daryl Grady made a 25-yard run for the Attack's second touchdown of the quarter. The final Attack touchdown came when Aric Evans caught Dan McMullen's pass and ran it to the end zone for his second touchdown of the contest. The McMullen brothers quarterback duo completed 14 of 32 pass attempts; Dan with 1 of 6, while and Mike completed 13 of 26. 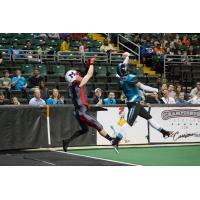 The Attack have three games remaining on their 2015 regular season schedule. Next Saturday, May 2, the Attack travel to Bloomington, Illinois to clash with the Edge. 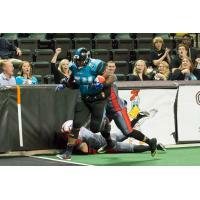 The Attack defeated the Edge in the final second of their only meeting so far this season; a 47-45 heart-stopper at the Family Arena April 11. 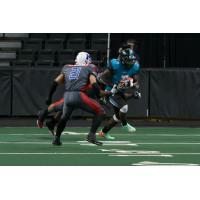 Following the May 2 trip to Bloomington, the Attack journey to the State Farm Arena in McAllen, Texas on Sunday, May 24 to clash with the Rio Grande Valley Sol, who are currently undefeated (3-0). 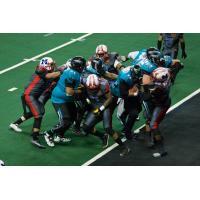 The Sol defeated the Attack 60-43 on April 4 at the Family Arena. 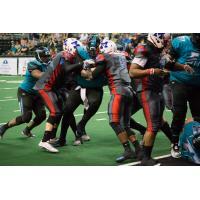 The Attack wrap up the regular season at the Family Arena when they host the Corpus Christi Fury Saturday, May 30 at 7:35 p.m. 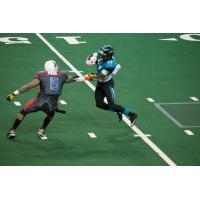 The Attack defeated the Fury in Corpus Christi March 29. Among the notable guests in attendance at Friday's game were the 23 owners of the Major Arena Soccer League (MASL) teams who are in town for owners' meetings. 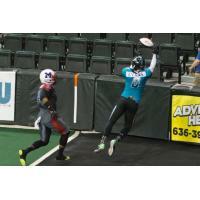 The MASL owners were the guest of Attack team owner Andrew Haines, who also owns the MASL St. Louis Ambush.